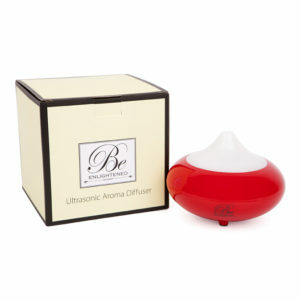 Our Ultra Sonic Aroma Diffuser is designed to create long lasting fragrance. 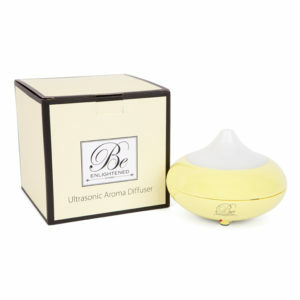 This slim and lightweight machine with its elegant and simple technology will create an ambient and fragrant haven. 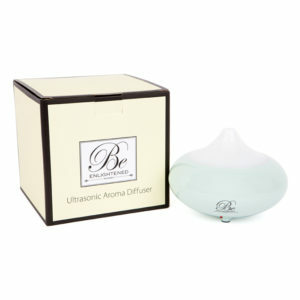 How to use: Simply add 90ml’s of water and 10ml’s of your favourite Be Enlightened diffuser refill oil. The machine has 2 settings: click the top button once for interval mode (3 minutes on 1 minute off); click the top button twice for continuous mode. The bottom button controls the light you can either have it change colours (do not press button); or simply select which colour you would prefer (choice of 7 light colours). Care Instructions: NEVER put more than 10ml’s of fragrance in at a time. If not using the machine simply tip the water and fragrance out or into a container to avoid wastage and wipe out the machine with a damp cloth and leave to air. Never place it under water. The machine will turn itself off once the fragrance and water level is too low.